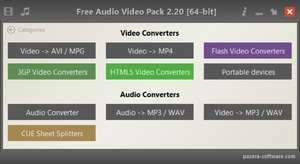 Free Audio Video Pack, formerly Pazera Video Converters Suite, is a collection of portable media conversion tools powered by ffmpeg. It can convert between many different audio and video file formats including MP4, AVI, AAC, M4A, WAV and FLAC. The user interface of Free Audio Video Pack is very simple to use and involves downloading the application and running it; no installation is required as Free Audio Video Pack is completely portable. The user interface of the application is straightforward and the menu selections will open up spawns for whatever task you're working on. Version 2.2.0 is a freeware program which does not have restrictions and it's free so it doesn't cost anything. Pazera Video Converters Suite download been highly rated by our users.